G. Webb Gallery (est. 1978) is located in Gatlinburg, Tennessee and is part of the Great Smoky Arts and Crafts Community. The gallery building was built in 1910 and remains one of the oldest standing farmhouses in the Glades area of Gatlinburg. Set in a turn-of-the-century board and batten house, G. Webb Gallery is located off the beaten path, but attracts visitors from all over the world. It’s a peaceful haven among flower gardens and towering hemlock trees. G. Webb Gallery reflects the spirit of the artist, a place where the creak of hardwood floors and the scent of past winter fires inspires pleasant memories of bygone days. Many folks are now second and third generation visitors. Few leave without a smile! The Gallery features the fine art of Tennessee artist G. Webb and his daughter Cami Monet Webb. G. Webb Gallery is a place where an art lover can begin a collection or supplement an already distinguished one. We offer limited edition lithographs, giclees, and original watercolours. G’s interests focus on landscapes, mountainscapes, florals, people, historic buildings, and the heritage of the mountains. What is a “Giclee?” Giclee is a French word meaning “to spray.” Giclees are printed on the same watercolor paper that G. paints on. The giclee is made from a computer process where so many dots per square inch (dpi) are applied (sprayed) onto the watercolour paper. It takes about an hour to make one giclee. This is exciting for an artist in that he can duplicate his work, and the print looks like an original. Giclees cost more but the results are worth it. Ceramic Mugs printed with G. Webb watercolours are available in our studio. Check out our book and reading room at the gallery. We offer local and regional books. Feel free to sit on the bench, browse through our books, and enjoy the fireplace on a cool day. Besides the local books, G. sells his three books: “When the Leaves Have Fallen,” “Spring Softly into Summer,” and “Caverns of the Blue Smoke.” G. illustrated these books and good friend Ron Evans wrote the stories and prose. G. has also illustrated several mugs, cookbook covers, as the “Scavenger Hike Adventures,” a mountain journal book of the Smokies. The “Scavenger Hike Adventures Book” is written by friends and fellow hikers, John and Kat Lafevre. These books are also offered in the reading room. Most prints are available in boxes of note cards at one time or another. When one scene sells out, we usually replace it with a new scene so sometimes your favorite scene will be a note card sellout. 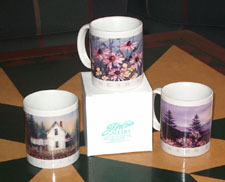 If you can’t find your print in the box of cards, we also offer the images on G. Webb Gallery coffee mugs. These are great collectables and make good gifts too! The Gallery also features baseball caps and t-shirts and the G. Webb Gallery Logo. The logo shirt and cap definitely completes the hiking ensemble for your favorite Smoky Mountain hike. Don’t forget the water….G. even has his own Mountain Spring Water bottled from a crystal-clear mountain spring (it’s served as a water supply since 1883). G.’s Mountain Spring Water is guaranteed to make you hike longer, paint better, and laugh more. It is available in singles or 6-packs. 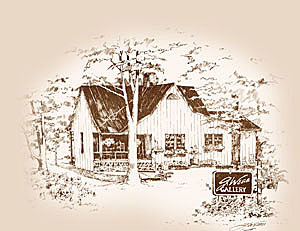 G. Webb Gallery offers a wide variety of gifts and unique farm products inspired by G.’s Morning Glory Farm and Vineyard. We offer nine different county-style jams and jellies including apple butter, plus the best honey in the mountains. Morning Glory Farm and Vineyard is located about 12 miles from the Gallery and is open at the end of July and the month of August. Hours are Mon-Sat: 10-5PM. It’s a good idea to call ahead. (Just in case you need a bushel of grapes!) Written directions are available at the Gallery. The 10-acre farm is reminiscent of a 1910 farmstead. Our vineyard features 8 varieties of grapes. Favorites include: Mars (a seedless blue), Einset (seedless, red and tastes like a strawberry), and Concord. Grapes are available daily from 1 lb. for table or a bushel basket for wine or jelly. Tour the farm, walk through the vineyard, and enjoy the views. Jams, jellies and honey are available too! Morning Glory Farm and Vineyard also grows Chardonel grapes which are sold to local wineries to make Chardonnay wine. As far as we know, G.’s chardonel grapes are the only ones grown in the state of Tennessee. Each September, the grapes are harvested. The 2004 harvest was produced and bottled by Smoky Mountain Winery located in Winery Square, Gatlinburg. The wine is titled “Guyot Gold” and is an excellent Chardonnay. This is definitely a limited edition; there are less than 900 bottles available. You can get a bottle “Guyot Gold” at Smoky Mountain Winery. You can also get one with the purchase of the framed giclee, “Morning Glory Vineyard.” G. will even sign the bottle for you! (Then you feel bad about opening it though.) We recommend a trip to the Smoky Mountain Winery, not only for a bottle of “Guyot Gold,” but to taste the other premium wines they sell. Greeting Cards of G. Webb watercolours are available in our studio. Mountain Valley Vineyard in Pigeon Forge, bought the 2005 Chardonel harvest. We are looking forward to another G. Webb wine and custom label/print. When in Pigeon Forge, visit Mountain Valley Winery, the tasting is fun, the wines are awesome, and they offer the Sweetwater Valley Farm cheese. That’s a souvenir in itself. Sunday: 12 to 5 P.M. Hours: Monday, Thursday, Friday and Saturday 10:30 A.M. to 5:00 P.M.
Sunday: 11 to 5 P.M.
© Copyright 2009-2014 by G. Webb Gallery. All Rights Reserved.